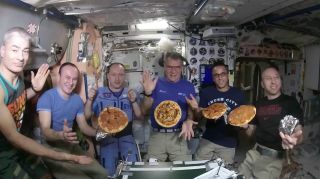 Astronauts and cosmonauts show off their pizza creations on the International Space Station in this still from a video by the station's Expedition 53 crew. They are (from left): NASA astronaut Mark Vande Hei; Russian cosmonauts Sergey Ryazanskiy and Alexander Misurkin; European Space Agency astronaut Paolo Nespoli and NASA astronauts Joe Acaba and Randy Bresnik. NEW YORK — Life on "One Strange Rock" — aka Earth — is weird enough, but when you leave the planet, you could encounter everything from cognitive changes to questionable space pizza. On Tuesday (May 22), Space.com attended a screening here of the finale of "One Strange Rock," a National Geographic documentary series hosted by actor Will Smith and produced by director Darren Aronofsky. The final episode airs on Monday (May 28). Astronaut Peggy Whitson floats in the cupola on board the International Space Station, backdropped by the Earth below. The finale centers on Whitson, who was the first woman to command the International Space Station and even went on to take the reins a second time during her three total missions. Aronofsky commended Whitson on the groundbreaking work she's done as an astronaut, and said about the final episode that it "kind of sums up why we were so passionate, me and Ari, to work on this." He added, "It's just really important, you often forget how amazing our home is … we forget how spoiled we are … the whole idea of the show is to celebrate our home, to give all of us an appreciation that's easily forgotten." When asked about the overview effect, a cognitive change that astronauts report feeling after viewing the Earth from space, Whitson said that "being in space…you look back at the Earth and you see the fragility of the Earth with this very thin layer of atmosphere, and we're trying to reconstruct an ecosystem in space." Whitson and Massimino both spoke to this effect and how their perspective was changed after seeing Earth from space with their own eyes. Pizza has also greatly shaped Whitson and Massimino's experiences in space. They discussed their shared longing for pizza while on the space station, and Massimino even went so far as to admit that he "actually ordered the pizza from the shuttle," on his way back down to Earth. "But," he added, "now they have pizza in space!" Still, Massimino said he is "very skeptical of this space pizza." Whitson didn't seem too enthused, either. "One Strange Rock"employs the unique perspective shared only by astronauts and cosmonauts to shape brilliant, visual stories from around the world. Whitson and Massimino tried to express how their experiences showed them how truly beautiful and special Earth really is. During the panel discussion, Whitson and Massimino described how, after their experience as astronauts, they started to consider all of us "Earthlings." The series echoes this sentiment, that our national boundaries and diverse cultures are only part of our beautiful, shared human experience on a planet like no other we've discovered.